Peter Kelleher lost his son to an overdose in Bangor in 2016 and now dedicates his life to providing critical supplies to homeless people. BIDDEFORD — Peter Kelleher knew the bad news about his son, Travis, was coming, despite all the times he had reached out to help, tried to steer him in the right direction. Travis Kelleher was homeless when he died in 2016. “I got that call I knew I was going to get. 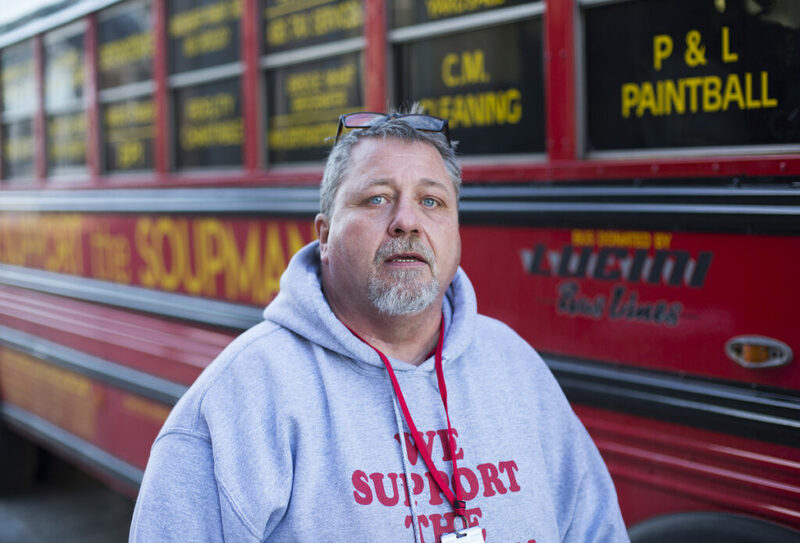 I was still heartbroken,” said Kelleher, standing outside the Biddeford Police Department on Monday in front of a former school bus – Travis’ Bus – that he now uses to distribute supplies to the homeless. Kelleher received “that call” on Sept. 2, 2016. His 33-year-old son had died of an opioid overdose in Bangor. Maine and much of the nation is in the grip of an opioid crisis, with 418 drug overdose deaths in 2017 and a projected 376 deaths in 2018. 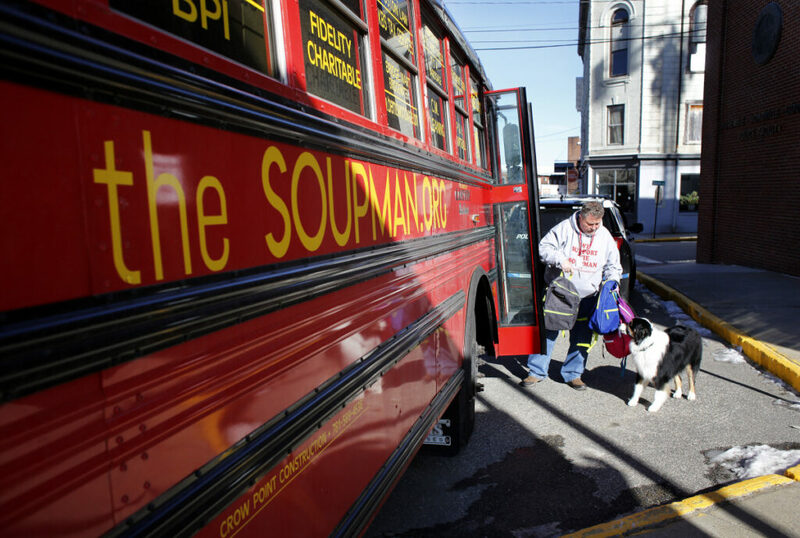 Peter Kelleher, also known as “The Soupman,” is on a weeklong tour of Maine to help the homeless, including stops in Biddeford, Portland, Newport, Augusta and Bangor. The bus is packed with more than 1,500 backpacks that contain winter clothes and toiletries for the homeless. 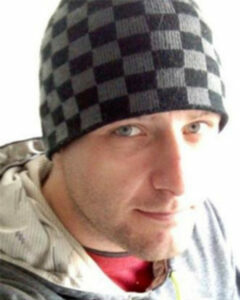 Travis was homeless when he died, Kelleher said. For eight or nine months after Travis died, Kelleher was despondent, “crying all the time” and “thinking I was a bad father.” He said he blamed himself because he and his son’s mother never married and had split up after Travis was born. He said his son had boyhood hobbies, like Boy Scouts and karate, but by the time Travis was an adult and heavily into substance use, his hobbies had evaporated. There were glimmers of hope – occasional jobs at restaurants or roofing – but Kelleher said his son’s drug use always returned. After several months of mourning, Kelleher said he needed to channel his sadness into something productive. So one day in 2017 he decided to take one step to help society, and “The Soupman” was born. Peter “The Soupman” Kelleher arrives in Biddeford on Monday to distribute survival items to help homeless people. He estimates that his charity has received $125,000 in cash donations and an additional $125,000 in supplies. “It all started out with 32 quarts of hamburg soup,” Kelleher said. Kelleher, 59, fed the soup to the homeless in Brockton, Massachusetts, and that act of kindness mushroomed into finding more ways to help the homeless. He founded Support the Soupman, a nonprofit organization that now, in addition to soup and bagged lunches, collects and distributes backpacks, toiletries and winter clothing for the homeless, and raises money for portable showers for homeless shelters. Kelleher estimates that the Soupman charity has received $125,000 in cash donations, and an additional $125,000 in supplies. On Monday, he handed a few backpacks filled with supplies to the Biddeford police and then headed to the Seeds of Hope Neighborhood Center, which has day programs and distributes supplies to the homeless, and dropped off another 50 backpacks. Rev. Shirley Bowen, Seeds of Hope executive director, said from what she’s seen, substance use and mental illness are major contributing factors to homelessness. She said Kelleher should be credited with honoring his son’s memory by helping others. “God bless him, because even though he went through a tragedy, he’s making a difference,” Bowen said. She said any assistance provided to the homeless – even something as simple as giving them some dignity by having access to toiletries – could help get people into the treatment they need. “We need to do all that we can to help,” Bowen said. Kelleher said he’s not stopping what he now considers a lifetime quest to help the homeless. “I’ll do this until the day I die,” he said.